Times Internet Ltd (Indiatimes.com) has partnered with Google to broadcast 74 live matches of the fourth season of Indian Premier League on Youtube.com, the latter's video sharing portal. 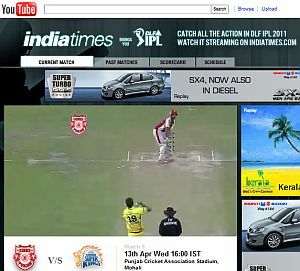 A YouTube channel Youtube.com/Indiatimes has been created which will stream the matches but with a delay of 5 minutes. It is a non-exclusive partnership between the two companies that will last two years. Indiatimes recently won the IPL rights for Internet, mobile and radio between 2011 and 2014, and paid a sum of Rs 261.6 crore. "Long form sports content has been a big focus area for us, and we're excited to partner with Indiatimes to bring live action from IPL Season 4 to cricket fans on YouTube and set a new benchmark in distribution of sports content online," said Gautam Anand, director, Content Partnership JAPAC - Google. Rishi Khiani, CEO, Times Internet, said, "Partnering with YouTube is step forward for us in creating supplementary distribution channels for Indiatimes to reach out to cricket fans world over." Indiatimes.com is the flagship brand of Times Internet, the Internet and mobile arm of media house Times Group.